I can’t believe that after all these years of living within walking distance of the former St. James Catholic Church on Delaware Avenue, located almost directly across the street from the firehouse with the beavers on top, that I had never walked inside of it. During this year’s Delaware Avenue Street Fair (and garage sale) The Wife and I had this opportunity. It being Saturday afternoon the church was open for all comers to inspect, part of what sounded to me to be a new policy of openness that bodes well for the future of this incredible neighborhood centerpiece. Actually the church is now officially called St. Francis, in 2010 it was administratively merged with the former St. John St. Ann’s Catholic Church down on Fourth Avenue in the South End, which now is also called St. Francis. 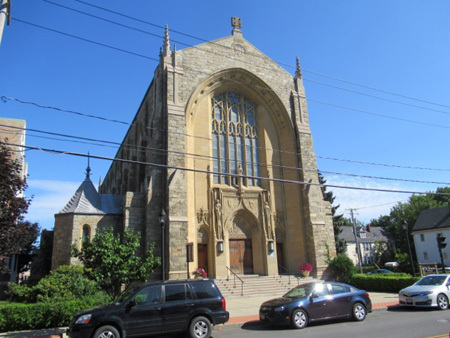 It seems that the Diocese, the local church administration, while it was under the former bishop wanted to shut down one or possibly both of the churches, part of the Diocese’s long standing policy of abandoning the City of Albany in favor of the suburbs. 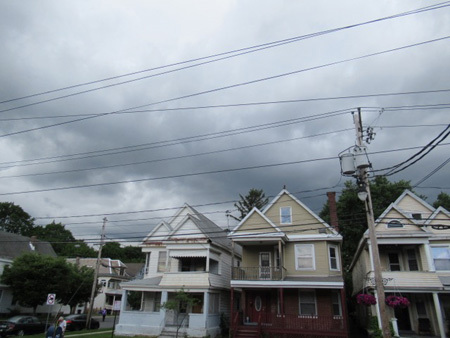 For a while it started to look like we were going to be left with two more magnificent rotting hulks downgrading both neighborhoods while the remaining parishioners would be left to fend for themselves. Fortunately the small but loyal congregations of both churches, both of which, I was told, have distinct identities and their own manners of worship, successfully resisted the closures and the churches are still with us and open for business. Since then the church on Delaware, I was told, while not exactly thriving has turned the corner and with support from the new local administration is attracting new congregants. 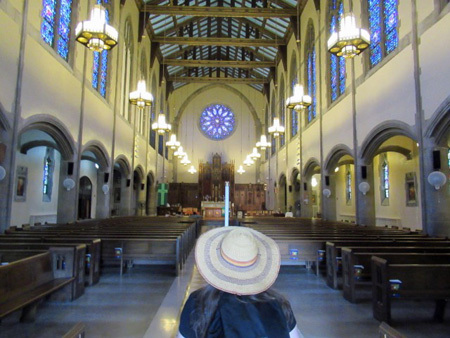 This is good news, for whatever your religious beliefs or lack of them, there is no denying that this structure is very much the architectural heart and soul of the sprawling Delaware Avenue neighborhood. Compared to the several street fairs that take place on Lark Street, the Delaware Avenue Street Fair is low key and basic. For one thing it’s more informal, pretty much anyone can set up a garage sale on the sidewalk. It’s much more spread out, you don’t have the densely packed crowds of people elbowing each other, and featured musicians set up on the sidewalk with open instrument cases busking. There’s not as much food for sale, but those $2 grilled hotdogs we bought at the VFW parking lot were good enough for us. Of course it was raining on and off, it wouldn’t be a street fair otherwise. There was one serious downpour before we arrived and we got hit with brief showers at least three times as we walked the length of the avenue from Morton Avenue to The Cheese Traveler and back. Despite getting splattered and soaked most folks stayed on the sidewalk selling their wares and plenty of people like us braved the storms. I was surprised to see the church with doors thrown open for the public, so I figured this was an opportunity I didn’t want to miss. A group of three ladies sat under a tent in front, safe from downpours, ready to answer any and all questions, while a younger woman worked the sidewalk inviting passing people to come inside. There were no formal tours or even someone watching the visitors inside the building, they were trusting the public to respect the church as they wandered about looking it over. Outside the building looks like a medium sized gothic cathedral, with wings set back on both sides so that it is more or less in the shape of a cross. The ornate exterior had been recently renovated and cleaned up, a testament to the dedication of both the congregation and the neighborhood advocates who did not want to see the building fall to ruin. We saw that the renovations and upgrades included the interior, every bit of the building displays a commitment to its continued upkeep. It looks pretty good all around. Upon entering one is struck by the amount of light inside, a glow that filters through the windows and through the translucent ceiling panels. Even on a day like this one with iffy weather the hanging lamps were almost unnecessary. The natural light bathes the worshipper, this creates precisely the kind of atmosphere that is conducive to spirituality, and gives meaning to the word sanctuary. 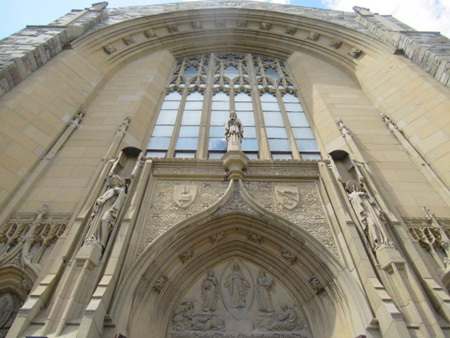 This building, which was completed in 1929, is an extraordinary application of the idea behind what we now call Gothic architecture, which arose in the 1100s AD in Europe. Before Gothic the prevailing church style was Romanesque, very stately looking but with interiors that were dark and somewhat cavernous. A church built in that Romanesque style was perhaps a good place to enact mysterious rituals, especially if the congregants felt they had to hide from the world. The idea behind Gothic architecture is that natural light is a manifestation of the divine, thus the place of worship should collect as much outdoor light as possible, and even enhance it. 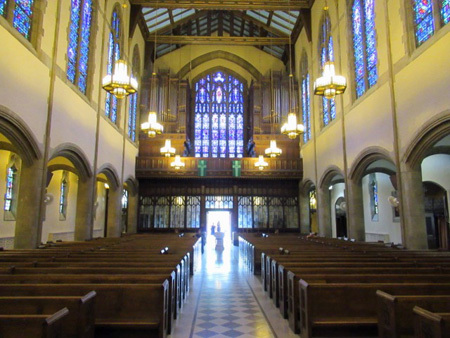 Thus instead of solid walls we have enormous windows made of ornate colored glass, instead of hallways we have walkways defined by arches that admit light into the interior. Before the invention and dissemination of electric lights, church buildings in most places were usually the only buildings that were full of light. Interesting that after a hundred or so years of electric light, all too many new churches have gone back to having solid walls excluding natural light, these places of worship resembling basement cafeterias or in the case of “megachurches” indoor sports stadiums. The artificial light that illuminates the worshippers in these places is phony and devoid of grace. 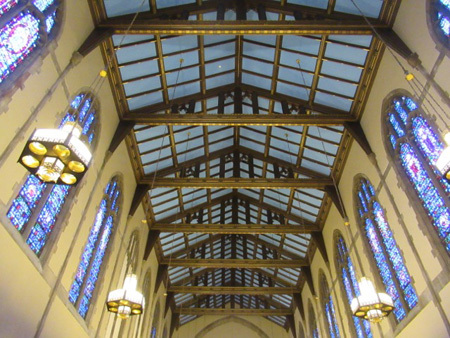 I’ve heard that there was intense debate around this issue of light before the Unitarian Universalist Church on Washington Avenue in Albany was constructed, the modernist solution they came up with is stunning and noteworthy but no improvement on the venerable Gothic plan. Inside the entrance is the holy water font, for you non-Catholics this is for the worshipper to dip his or her fingers before making the sign of the cross, touching the forehead and the shoulders. This act is more than symbolic, it is a spiritual cleansing that demonstrates respect for the holy sanctuary that one is entering. Chemically it’s just water, but it is blessed by a priest and thus infused with divine grace. If you’re a Protestant that is all nonsense. Originally the Protestant Reformation was all about decentralizing religion, the reformers saw such things as performing an entrance ritual with official water sanctified by a bureaucrat as nothing more than a means to controlling the individual for the benefit of a self-serving corporation. There is, of course, truth to that, but there is also a substance to the spiritual cleansing that is very much lacking in Protestant ideology, a set of ideologies that doesn’t seem to have put a stop to centralized control by corporate hierarchies. The holy water font is very interesting, about four feet high carved from a single white stone, marble perhaps. It is set in the aisle between the pews and thus very much visible to all. The basin is divided into two parts, one for water and the other containing sea shells. There is also a sea shell on the rim covering something, but I did not presume to lift it to look underneath. The shells are a symbol of St. James, which is the old name for the church that the Diocese presumed to obliterate some seven years ago. By this relic it seems that the congregation has not abandoned their identity as the house of St. James, a lingering defiance of the meddling decree handed down by the regional managers of the corporation. 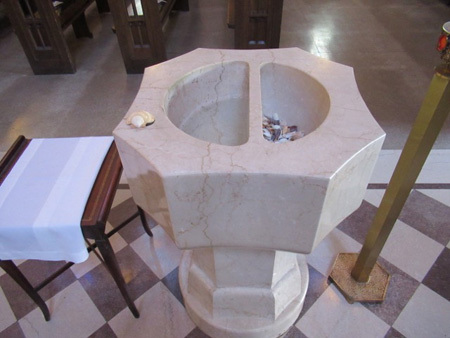 The name St. James is no longer seen in the church as an identifier, but the visitor cannot help but practically run into this basin full of shells. Like any corporation the Catholic Church is run from the top down, yet those who run the church from the top are sustained by the faith of people who comprise the congregations of local churches like this one. The modern Church, in America at least, is characterized by this constant push and pull between the upper echelon bureaucrats and the bottom rung people who demand that the bureaucracy adapt itself to their faith. I saw this in the small Polish church I attended as a child, and I see this again here at the church on Delaware Avenue. 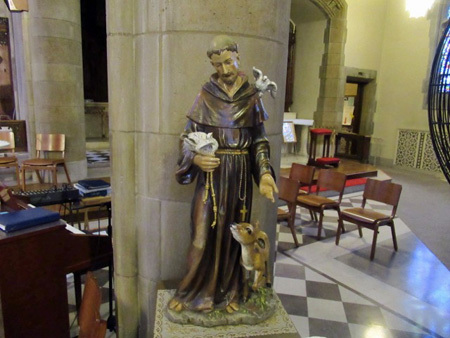 That is not to say that there is open defiance to the Church bureaucracy or that St. Francis is ignored or neglected, a statue of the saint with his attendant animals is right up front to one side of the altar. There was even one of those delightfully raucous blessings of the animals on St. Francis’ feast day several years ago, where people brought all kinds of ridiculous creatures to the church to be blessed. 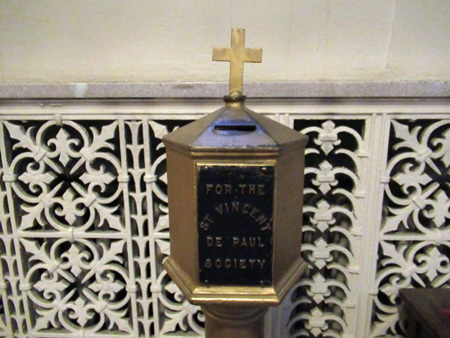 Apparently this is done on a revolving basis throughout the Diocese at congregations that bear the St. Francis name, hopefully it will returns to Delaware Avenue soon. But the entire name change thing was handed down from above for what can only be called arbitrary political reasons that ran contrary to the wishes of the congregation. The congregation, which had been formed in 1837, has always called itself St. James, even the street alongside the building is still called St. James Place. Perhaps as people continue to move back into the City of Albany, the Diocese administrators will reconsider their anti-urban strategy and reverse their ham-handed decision to change the name. 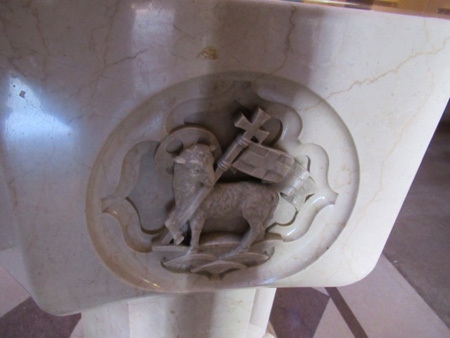 Much of the beauty of the church is in the fine details. 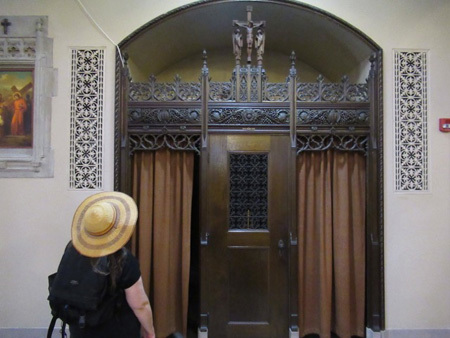 The Wife admired one of the confessional booths, which is topped with stunning wooden carvings. She peered inside and said, “There’s no chairs!” I said, “See that bench? You kneel on that and confess your sins to the priest.” “He’s inside there?” she asked, pointing to the wall with the grate. “Not at the moment,” I said. Which is too bad because The Wife is a Godless Protestant on the fast track to Hell and desperately needs to confess. I figure a thousand Hail Marys and ten thousand Acts Of Contrition might get her on the waiting list for Purgatory. This of course is one of the basic contentions between Catholicism and Protestantism, does the person confessing need an intermediary or not? Does the confessing person need a guide to properly confess or does that guide corrupt a person’s relationship with God? This may seem like an esoteric issue to all too many people in this modern age but it most certainly is not. Confession, whatever form it takes, is the acknowledgement of reality in one’s self. It is the acceptance of personal responsibility. Sad to say, we live in a time when fantasy is a popular commodity and personal responsibility is openly sneered at and considered a weakness by our leaders and role models. But for all its corporatist faults the Diocese does indeed sponsor and coordinate a network of relief programs for the poor and indigent of the City of Albany and elsewhere in its territory. There are too many programs to name, many that have familiar names that go back years. The Catholic Church in general has the most extensive and well administered programs of any religious institution, available for all, not just Catholics. A notable recent program is the establishment of Law Enforcement Assistance Diversion (LEAD) in partnership with local police agencies and a variety of social advocacy groups. The idea of LEAD is to find alternative solutions outside the court system for non-violent offenders, basically a kind of mediation program that looks to changing the behavior of offenders rather than merely punishing them. St. Catherine’s, a subsidiary of the Diocese, has been tasked with providing the administrative structure and training for the program in the City of Albany, it is perfectly natural that the Catholic Church steps up to offer its expertise. The divine natural light that enters the church is enhanced by the enormous stained glass windows which are three-tiered. 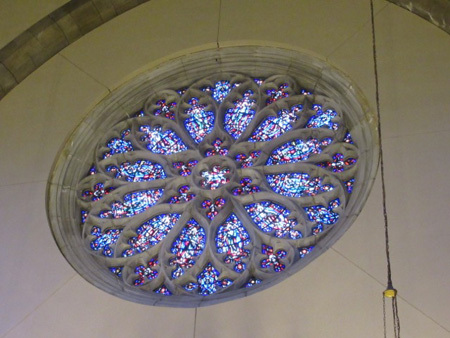 The larger center sections are of course devoted to depictions of saints, but the smaller bottom and top sections display the interests of the congregation when the windows were made and set. As is customary in many churches, the bottom panels of many of the windows record the names of generous donors who contributed to the building of the church. Girls! 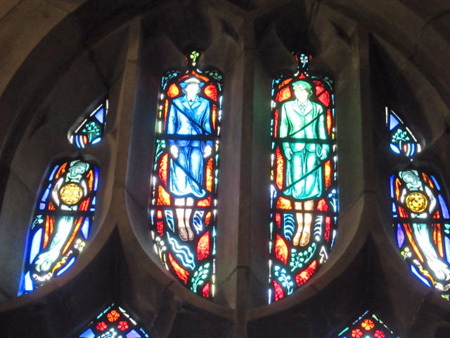 The Wife noticed that the top windows depict women in uniform, flanked by angels. Immediately after World War 2 the significant contributions made by women to the war effort, both at home “manning” the machines of industry and serving in the military, was simply erased as if it had never happened. Millions of young women who had been thrust into positions of responsibility and unheard of self-sufficiency so they could contribute to the war effort were just as suddenly tossed back into a position of dependency and inferior status. These women mostly accepted their demotion, but many harbored a suppressed resentment that was felt by their Baby Boomer children, particularly the girls. The erasure of their accomplishments was nearly complete, so it is astounding to see this record remain in these windows. 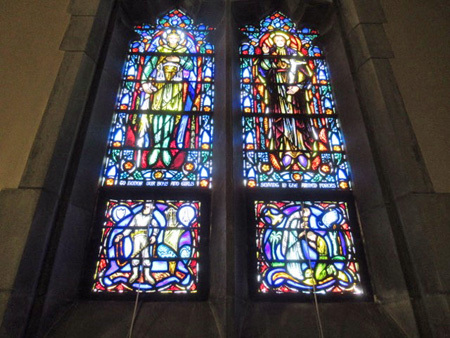 It is not hard to imagine that the women of the congregation from that time had a strong influence on the design of these windows. One of the defining characteristics of Catholicism is the hearty embracing of icons, and so this church is crowded with images and statues, including the obligatory Stations of the Cross. Among monotheistic religions today using images is mostly a characteristic of Christianity, both Muslims and Jews firmly reject icons. 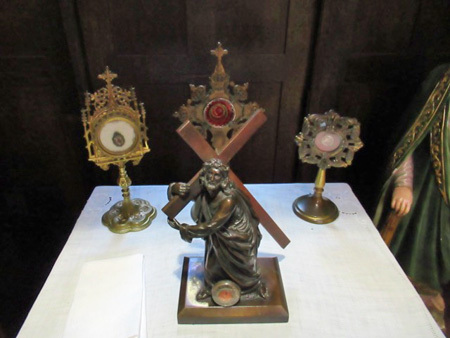 Those who reject them consider icons to be distractions from true spirituality and thus promoting falsehood, a point which we modern folks who are so easily distracted and influenced by flickering images may want to give some consideration. The altar is set back from the seated congregation on a deep dais, like one would expect in a larger cathedral. 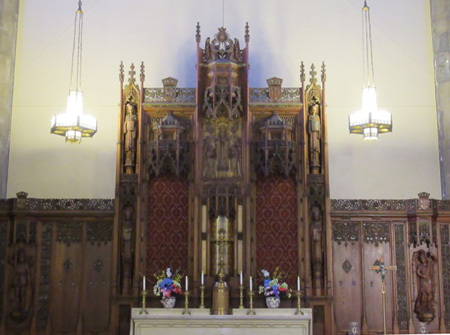 On the wall above the altar is an enormous magnificent carved wood cross. It is a highly detailed artwork that really needs to be studied up close to be appreciated. But I certainly wasn’t going to disrespect the church by clambering up the dais and rummaging around the altar for a good photo. In the small low-rent Polish church I grew up in there was an enormous cross behind the altar with a gigantic lifelike bloody dying Jesus hanging from it. Why that thing never gave me nightmares is actually an interesting question, this realistic violent image has always been part of the background for Catholic children. 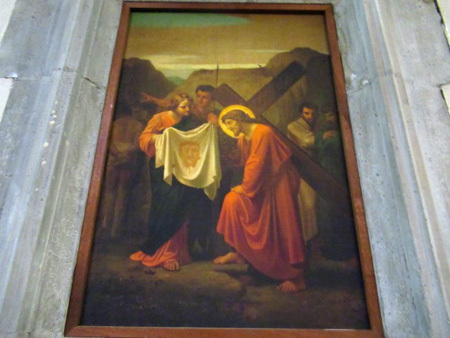 What is interesting is that this church has rejected that ubiquitous dying Jesus in favor of an abstraction of a symbol. I wonder why exactly they chose that. Distance and large scale is an issue since the current active congregation is less than a hundred and fifty people according to the ladies sitting out front. In the middle of the 20th Century the entire neighborhood was dominated by Catholic immigrants and their children, mostly Italian and Irish, working class people for whom faith was identity. Back then the church was too small for everybody, a bit of size and distance didn’t hurt. With the smaller congregation of today the scale of the church has to be compromised for the Sunday masses. For example, there is a magnificent looking set of organ pipes gracing a high gallery at the front of the church on either side of a space for a choir with magnificent windows behind. I’d sure like to hear that pipe organ played one of these days, but I’m guessing it doesn’t get used very often. In front of the altar is a small electric organ, and behind it a set of folding chairs (which can be seen in the photo of St. Francis.) Apparently this is how the music is made for the Sunday mass these days, and this is where the choir sits. In a sense these latter day Sunday masses are like gatherings of the last defenders of the faith, huddled together in the cavernous house of glory. This may sound ridiculous to some people but I’ve always felt that churches, especially beauties like this one, are much more than mere buildings. So much human energy is invested in these structures, so much of the life and spirit of so many people, that I consider them more than just arrangements of stone and wood. There is a life to such a church as this one that can’t be defined by a real estate tax map, and while that structure is alive it sustains the community around it. Older buildings, I’ve always felt, are the sum total of the people who have lived there and used them. I look at the hundred fifty year old plus buildings in the City of Albany and I see more than roofs and walls, I see that sum total shimmering. How much more of that sum total is invested in a church building that has been at the center of so many lives? This is a big reason why I cannot comprehend why certain civic authorities are so enamored of wrecking our old buildings in the City of Albany, that seems to me to be more like murder than demolition. Our older buildings are living things, they are not the same as most modern buildings which are designed to be torn down and replaced after 30 years. Those newer buildings are designed to reject their inhabitants, they are made to be lifeless. So I’m grateful to the congregation of the church on Delaware Avenue for their successful efforts to defend their building and to keep it alive. May they grow stronger in the future. Wasn't there a shuttle going up and down Delaware Ave? Yes, but we couldn't take it because they removed the tracks. I don't know how often the pipe organ is used for services at the former St. James Church on Delaware Avenue, but the Times Union reported on an October 2011 organ recital there (then already St. Francis) to celebrate the organ's 80th anniversary and to raise funds for the organ's maintenance (http://www.timesunion.com/local/article/Church-organ-hits-high-note-at-80-2230798.php). 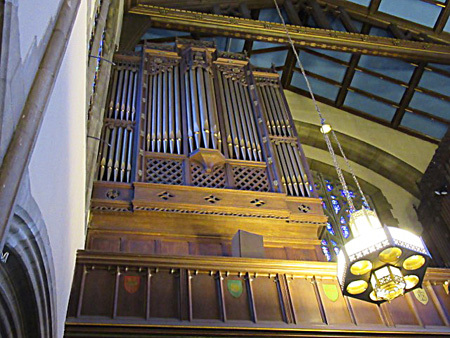 That article noted that the historic and challenging organ has 3233 pipes. Donald Ingram, who performed in the 2011 recital, gave a delightful recital (also a fundraiser) in November 2016, accompanied by his partner, bass-baritone Eugene Tobey, singing from the choir loft. Great sound! 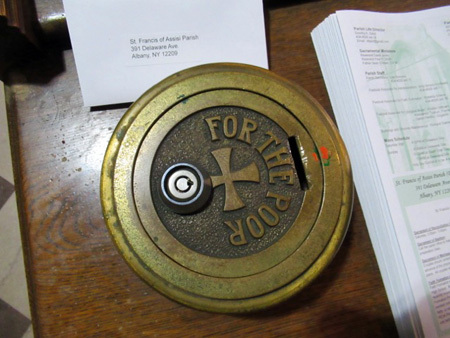 There was another fundraiser for the organ's maintenance in April. I don't know about future events, but I'll bet that DANA will keep an eye out for that for you. When the opportunity arises to hear this organ, don't miss it. Well over twenty years ago there was a young red-headed priest at St. James who hired me to play the bagpipes on St. Paddy's Day several years in a row. He would have me come out of the wings playing "The Wearing of the Green" at which point he put on a Kelly green tam-o-shanter and we'd process out of the church. Thanks for this eloquent post.